CHICAGO - There's an old joke: Where does a tiger go for a walk? CBS Chicago reports. 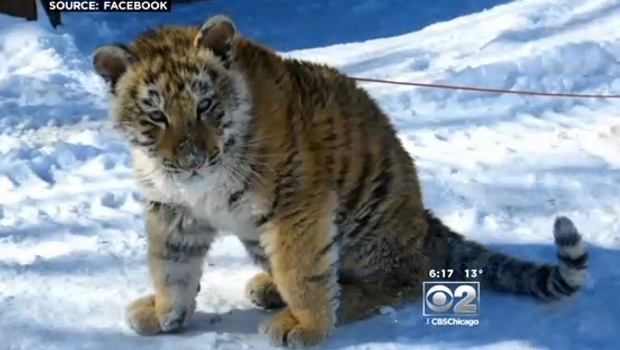 But police in suburban Lockport, Ill., 30 miles south of Chicago, are not laughing after a tiger cub took a stroll through the city's downtown on Sunday - albeit on the end of a leash, the station says. The tiger and its owner, John Basile, were earlier spotted inside Uncle Richie's Bar, reports CBS Chicago's Derrick Blakely. Basile's tiger apparently bit a woman in the bar in December, although she never reported it, Blakely reports. "My concern was really for the people who frequent the downtown area," Lockport Police Chief Terry Lemming said. Basile's attorneys said he "has been cooperative with the authorities and looks forward to his opportunity to address the allegations in court." He has been rescuing, housing, and teaching with wild animals for nearly 30 years "without incident," they said.